This product appears to have been discontinued, and I found it at Marshalls for $13. This stuff brightens skin instantly! I'm so sad this is discontinued! I had been skipping foundations and just wearing this for a few days while I was trying out some pore treatments and cleansers, and my skin looked absolutely radiant! There is no coverage or color tint, and its main function is as a shimmer cream that has very subtle shimmers, and it also acts as a light moisturizer. The pore treatment I was trying was a failure, and while looking for an alternative I found that many women had determined their foundation was causing a lot of their issues with their skin's appearance, so I started custom-mixing some products to make my own foundation blend. 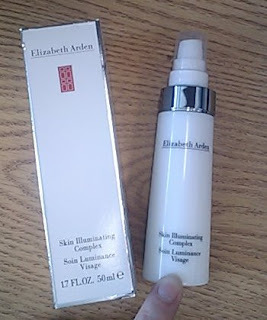 I've been using a half-pump of Lancome Teint Idole, two pumps of Lancome LaBase Pro, two pumps of Elizabeth Arden Skin Illuminating Complex, and a small pea-sized drop of BB Cream (any of the Asian ones I've been testing have worked well). I mix it all together on my fingertips, and apply it to my face, rubbing it in like a moisturizer cream. I have found that this mix, for me, does the best job I've seen yet at completely concealing my pores, evening my skintone, smoothing out the skin surface, not settling into any fine lines, and wearing very well through the day with an almost dewy finish. I really like how this can pull double-duty, as a "no-makeup-day" cream, and as an add-in to my custom foundations.